I was 150lbs (Height: 5’2″) for a very long time until I had a terrible ankle injury; this injury resulted in 5 screws and 1 plate. During recovery time, I gained approximately 25lbs. I was in physical therapy for 6 months and it took me almost 8 months to walk again without any assistance. My Orthopedic Surgeon explained to me that I may not be able to participate in any strenuous activities for the rest of my life, because how bad the bones were broken in the ankle. That was my wakeup call! I knew I needed to take control of my life; I started to eat healthier and work out like a mad woman! My weight loss journey began in June 2010 at 174 pounds. I returned for my 2 year orthopedic checkup on Jan 2011: 45 lbs lighter, ran a half marathon (13.1 miles), and completed multiple Beachbody fitness programs. I successfully achieved final goal weight of 114lbs in May 2012! I have always been pretty active, but I had a lot of work to do to improve my eating habits. MyFitnessPal was a great tool for me at the beginning of my journey in tracking foods I was consuming throughout the day. The first month of logging foods really shocked me. I didn’t know I consumed so many carbs and sugar components. I started researching ideas on how to eat better without completely omitting things I love: cake/pizza/breads. For example, home-made pizzas loaded with veggies instead of meats, soda cakes topped with fresh berries and whipped cream. I had to tweak recipes and minimize portion sizes, but overall I didn’t take away too many items and I didn’t deprive. In addition, planning was a key factor in my success. I planned every meal for the week and documented my progress. I left little room for errors or excuses. As I learned how to control portion sizes and balance ALL nutritional components, I began to be less scrutinizing on planning meals. The biggest nutrition trick which helped me turn my body into a fat-burning furnace was eating every 2 hours totaling to 6 small meals a day. My body is still trained like this even while maintaining current weight. I never let my body get hungry. Recently, I began training for my first bodybuilding bikini competition. 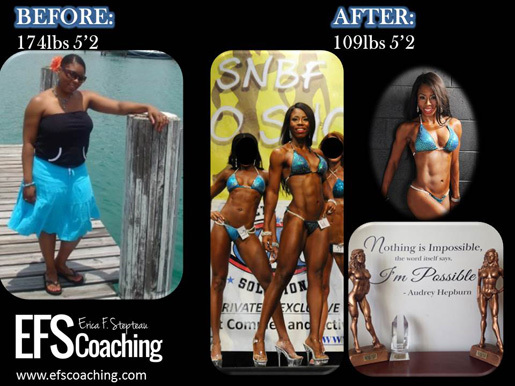 It took me 6 months to take my body from “skinny fat” phase to a sculpted stage-ready body. After competing in competition and placing 2nd Place in both novice and open bikini classes, I decided to do another show 3 weeks later! I also placed 2nd in open bikini class during the Nov 1st 2014 SNBF body Competition. In 2015, I am stepping my game up; adding 15lbs of lean mass to compete as a Figure Competitor. My aspiration is to become a Pro Figure Athlete with SNBF then move on to compete in NPC shows. Long-term goal is to become IFBB Pro Figure Athlete. I have a lot of work to do and I am ready for the challenge!! In the past, I worked in corporate life as a Purchasing Agent in Supply Chain. I was miserable and all I thought about was how I can help “Attack Obesity One Person and One Household at a Time”. In Feb 2013, I created a Facebook Group page to help others achieve their health and fitness goals using some of the very same principles I’ve used in my journey. This group started off with 39 people and as of Jan 2015 there are over 4000 followers on my fan page. I share daily tips, tricks, and monthly MIND, BODY, and SPIRIT challenges. I live, breathe, and think about nutrition and fitness. In Jan 2014, I resigned from corporate life to pursue my passion on a full-time basis. I am so glad I experienced that ankle injury because it allowed me to find myself in many ways. I didn’t know how ambitious I was until I lost the weight and also this path has allowed me to meet so many people so that I can help them achieve their goals and be Fit4Lifel!!! Way to go Erica great job! I am currently at 179 lbs. and my goal is to get to 140 lbs. by June 22nd and then from there to 130 and from there I will tone up. I am working on my meals by planning just like you have done. Congrats again Erica! I need help I like you were need to lose 75 pounds in order to be healthy and feel good about myself. In a rut. Need motivation.